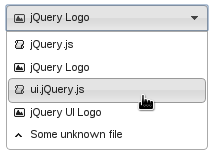 I took the jQuery UI selectmenu widget for a test drive today, and it's looking good. The widget itself isn't much more than a means to tie select elements into the theme framework, which is important in many circumstances. For example, this widget negates the need for programmers having to base a menu widget on select elements. Instead, the selectmenu uses a menu widget internally, utilizing the parts it needs. The user interaction is nice as well — all keyboard actions work as expected. There is a nice demo showing how to extend the rendering capabilities of the select menu, showing an icon for each item. But the demo misses out on how to show the icon for the currently-selected item. It also did things a little differently than I'm used to, so here is my take on the demo, adding the selected icon capability. The HTML for the select menu is pretty straightforward too, the difference here are the data attributes I've added for the icons. And here are the selectmenu widget modifications. // define it for every instance. // Adding the new item icons flag. // Constructor. First calls the real constructor. // the icon data attribute. // room for the icon. // Renders the icon for each item in the drop-down. // an icon to it. // Adds the icon to the rendered item. // Updates the selected item icon.